People around the world equate the word "Disney" with family fun. Although the Disney movies and theme parks are the company's best-known products, Disney Cruise Line launched its first ship in 1998, and Adventures by Disney began offering worldwide premium family tours in 2005. These two Disney brands have become marvelous options for travelers who love organized tours and cruises. Cruise lovers appreciate the fun-for-all-ages, exceptional organization, and amazing activities and ports of call on the Disney cruise ships, and many have discovered that one of the numerous Adventures by Disney can easily be combined with an ocean or river cruise. Disney has partnered with AMAWaterways to offer Rhine and Danube River cruise adventures, and travelers can add-on Adventures by Disney extensions in either Amsterdam or Prague before or after some of these cruises. Disney Cruise Line and Adventures by Disney have teamed up to offer all-inclusive five to eleven-night cruises of the Mediterranean or northern Europe on the Disney Magic. Guests booking these cruise tour packages enjoy all of the onboard activities and dining options on the Disney Magic cruise ship, but also have private tours in the ports of call that include special things to do and see for families or kids. Since everything is covered and you will have two excellent Adventure Guides leading the tour, you don't have to worry about transportation, luggage, or trying to plan what to do ashore. Adventures by Disney also offers three-night short escapes in Copenhagen before northern Europe cruises and in Barcelona before Mediterranean cruises. These escorted tours are perfect add-ons to the cruises and feature fantastic cities to explore. Disney's short escape in Barcelona starts with a pick-up at the airport and transfer to a great 4-star hotel, the Silken Gran Havana — your home for the next three nights. This hotel is conveniently located on the Gran Via of Barcelona in the Eixample district, within walking distance of many restaurants, bars, and historic sites. It has a delightful rooftop bar and swimming pool. Your two Adventure Guides welcome you to the hotel and, depending on your time of arrival, make recommendations on things to do until the group assembles for the first night's meet & greet before dinner. Many flights from North America arrive in the morning, so you might need to check your luggage with the hotel for a few hours before settling into your hotel room. The Adventure Guides provide maps and suggestions for exploring or where to have lunch on your own. It's nice to stretch your legs after a long flight! The tour group meets at the hotel before going to dinner. Although everyone has gotten the Barcelona Short Escape itinerary details in advance, it's nice to go over the schedule and ask any unanswered questions with the experienced, knowledgeable, Adventure Guides. Kids (or adults) who collect Disney pins will be delighted to receive the first of several unique Disney Barcelona-related pins at this meeting. What a great souvenir! Dinner on the first night is at Xalet de Montjuïc, an excellent Mediterranean restaurant on Montjuïc, a large hill overlooking the city. The traditional Spanish meal starts with a parade of a dozen or more tapas served family style, followed by a main course and dessert. Guests must pace themselves as they sample the small plates of tapas or they won't be able to enjoy the main course or dessert. Although tapas are often snacks or appetizers, many Spanish restaurants like this one have evolved the small plates into sophisticated dishes. You might start off with olives, cheeses, and pieces of bread, but will also see Spanish omelets, meat, shellfish, fish, and chicken tapas. By the end of the memorable meal, everyone is filled to the brim with Catalan cuisine and ready to have a good night's sleep before a busy day touring the next morning. After a great buffet breakfast at the hotel, day two of the Adventures by Disney Barcelona Short Escape focuses on the city of Barcelona, with a local guide and private tours of two of the city's architectural highlights, Park Guell and La Sagrada Familia, both designed by the famous architect Antoni Gaudi. The day also features a walking tour of the old town, which is filled with narrow streets and its own great architecture. This walking tour includes the opportunity to experience La Rambla and to stop in the street's famous market, La Boqueria. Despite the big breakfast, the tour leaders find time to let everyone linger over a delightful lunch between sites and tours. Can Travi Nou is a very cute city venue with a farmhouse look and feel. 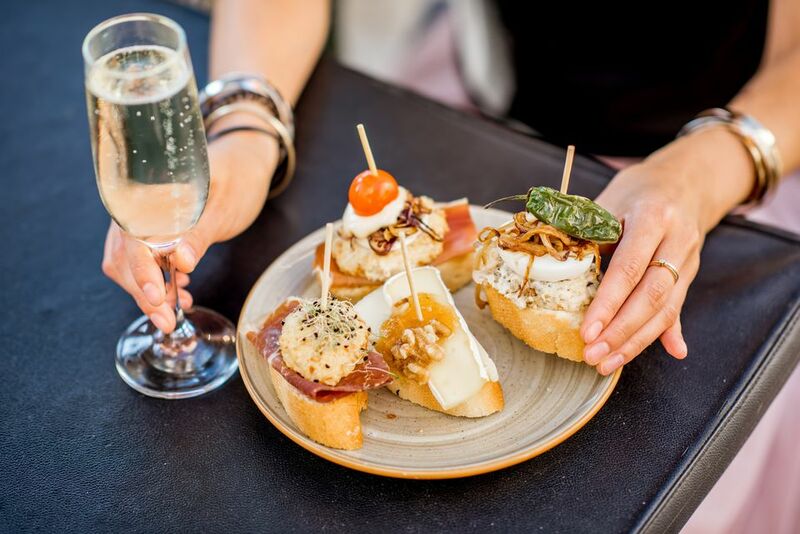 Like many Barcelona eateries, lunch includes a variety of delicious, diverse tapas and feels like a true Catalan lunch. After a long day exploring Barcelona, the tour group has dinner on their own. The Disney Adventure Guides provides some excellent suggestions for families or couples. The rooftop bar of the hotel is a great spot for an after-dinner drink with a view of the city lights. The Adventures by Disney Guides take its Barcelona Short Escape tour group outside the city on the third day to visit the mountain Benedictine monk retreat of Montserrat. After two days in the city, kids and adults appreciate the chance to do some hiking and exploring in this mountain region. Montserrat (serrated mountain) is a rocky mountain retreat and hotel that can be reached by bus, car, narrow gauge train, or cable car. Disney escape participants take a bus to the train station and then ride it to the hotel and monastery. After reaching the top, the local guide shows everyone the inside of the church and gives free time for exploring the church, seeing the famous Madonna up close, riding the funicular train to the summit, or hiking on some of the numerous trails. A late lunch is had at the hotel and the bus leaves for Barcelona in the mid-afternoon. After an hour or so of free time, the bus leaves for dinner and a flamenco show at Barcelona's Spanish Village Poble Espanyol. This complex includes re-creations of typical buildings and architecture from around Spain. The group has time to tour before dinner and the show. The flamenco show is excellent and as good as you would see in Madrid or the Andalusia region, which is the home of this dramatic dance. It's a marvelous ending to an amazing three days in Barcelona. The tour group can enjoy a leisurely breakfast the next morning before heading to the Disney Magic cruise ship to begin another magical Disney experience, or to the airport to go home. The company makes the transfer experience extremely easy, and their timing is perfect. By the time everyone checks in, it is time to board the cruise ship and spend five to ten days exploring ports of call in the Mediterranean Sea.